Pancake model with thumb-break retention to ensure fast draw with minimal motion. Front Line's New Generation material is the result of extensive research with the Israeli Defense Forces. This material provides a consistent perfect fit that does not change with exposure to water or harsh environments. 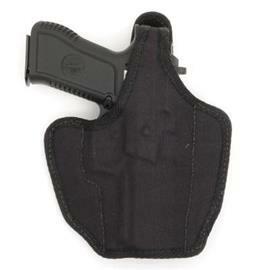 These holsters are lightweight and durable. The inner layer is a smooth, waterproof velvet that offers the best possible protection for the finish of your pistol. Over this is a layer of firm polyethylene for extra protection against impacts. The third layer is a molded PVC that fits the shape of the weapon perfectly, and will neither warp nor distort over time. The outside layer is a durable, tightly-woven Cordura. The holster can be washed with soap and water and will withstand intensive use for many long years.